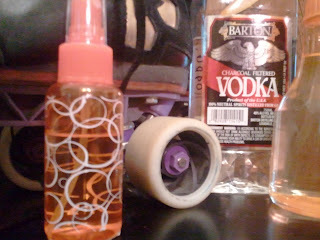 Cooking on Skates: Vodka for Derby Pads: Improved! I first tried using vodka on my derby pads in June 2011. Holy crap, that was more than a year ago! A few weeks later, I even followed up on the progress of using vodka to disinfect pads between washings and wearings. Honestly, the vodka seemed to work great. What was not great? That no amount of duct tape could keep spray bottles from leaking my bag. Horrifying! Every so often, I'd look for small spray bottles in Walmart or Target and not be happy with what I found. Then last week, I was picking up some things at Target, wandering around in a semi-sick daze. Near the cough drops, I saw travel-size products out of the corner of my eye. In those bins, there were various empty travel-size bottles. GENIUS! How had I never thought of that? And guess what? It's the perfect size! It doesn't leak! It sprays the most fantastic fine mist! I'm the happiest less-stinky derby skater! So I was going to show you guys exactly which little spray bottle I bought and love, but it's not online. Well, crap. If you live near a Target, go get one of the little 2 oz empty spray bottles out of the travel-size section. Or this one is less than $1, so you might as well buy a few to justify shipping.